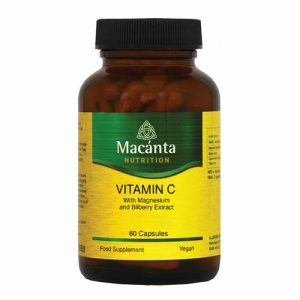 Macánta Vitamin C with Bilberry Extract gives you the immune boosting properties of 500mg of Magnesium Ascorbate, a low acid form of Vitamin C, along with the antioxidant rich extract of Bilberry. Vitamin C’s most notable role is as an antioxidant, helping to reduce and repair the damage caused by free radicals in the body. It also contributes to normal collagen formation for the normal function of blood vessels, bones, cartilage, gums, skin and teeth. In this formula, the antioxidant power is strengthened even further working in combination with Bilberry Extract. The herb bilberry contains high concentrations of tannins called anthocyanidins that are powerful antioxidants. Bilberry supplements are often used to aid the maintenance of healthy eyes and connective tissue.